Based on the large amount of misinformation I have seen bandied about here concerning these groups of individuals in addition to the number of questions I keep seeing, I decided an information clearing house of sorts was in order. http://www.immortalgeisha.com/book_review_01.php?id=8 -- invaluable in my opinion, and available cheaply due to being reprinted. de Becker was contemporaneous with his subject matter (The Nightless City was originally published in 1899), and he also references the names of his primary sources, e.g. Yoshiwara Taizen, Dobo Goyen, etc. Jigoku: "Hell women," unlicensed prostitutes. 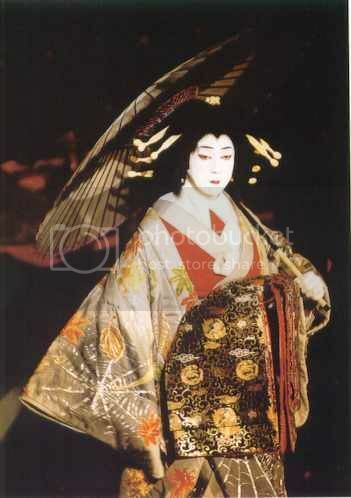 Tayu: Generally used to refer to the highest-ranking courtesans of the Shimabara in Kyoto. 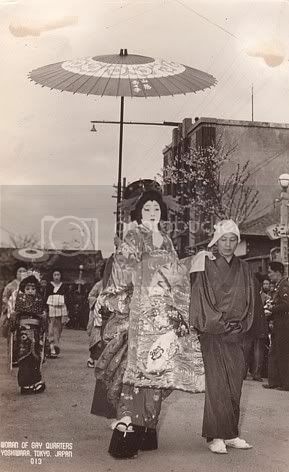 While there were once tayu in the Yoshiwara, the rank was extinct by 1763. 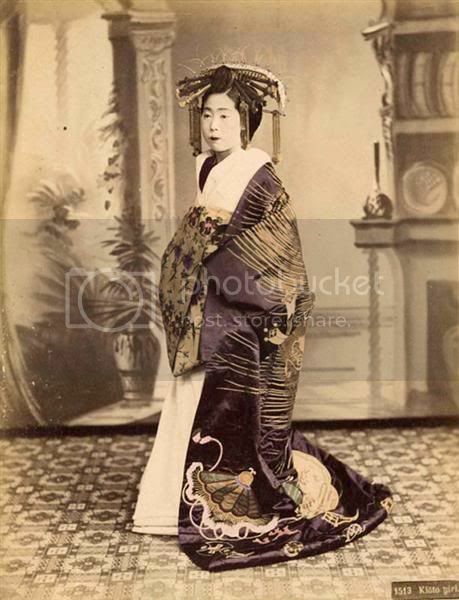 Oiran: A post-tayu term used to refer to the highest-ranking courtesans of the Yoshiwara in Edo. Their rank was called Yobidashi. Shinzo: An apprentice courtesan. There were two types: furisode-shinzo and tomesode-shinzo. Kamuro: The child attendants of the courtesan. Hikite-jaya: "Introducing tea-houses". These places acted as a go-between for the customer and the brothel. Noshi musubi -- the heart-shaped musubi typically associated with Kyoto tayu. Manaita ("chopping board") musubi -- the thickly padded and often outrageously decorated obi worn by oiran--both real and actresses--and kabuki actors. More to come when I can match names to other musubi.